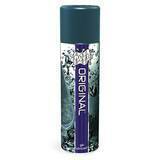 A gentle, water-based, colourless, greasless, non-staining, long-lasting lubricant. Contains pheromone formula so you can drive your lover crazy while, well, driving them crazy. Latex friendly too.